Once upon a time, there was a chubby Tarte lip pencil I was very fond of. So fond of, in fact, that I brought it everywhere just in case I didn't have any other lip product with me. It was one of those anytime, anywhere, any day hues. It was supposed to be a beautiful friendship. One day I reached into my bag intending to grab hold of a regular black pen, but instead out came a goopy melty stick smeared in beige pink. I dug around the bag in hopes that it hasn't contaminated the other areas but of course it did. I cleaned my bag in vain (streaked beige pink even till this day), angrily flung said Tarte lip pencil into the trash, and told myself chubby lip pencils cannot be trusted. I suppose it's good that beauty bloggers in general (or just me?) lack resolve when it comes to restrictions, because NARS Mexican Rose is the most interesting out of all the lip products for this season. 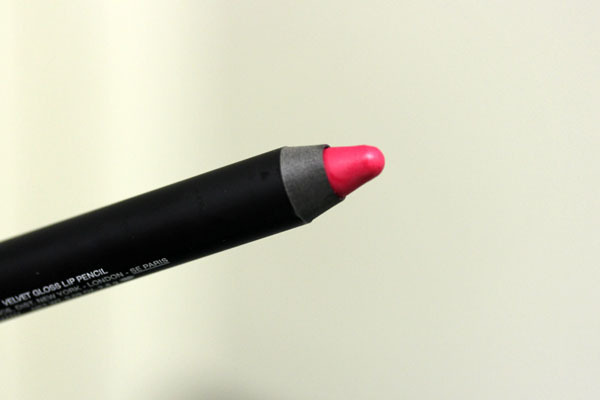 In fact, it's the only lip product I purchased from this year's Spring collections, and I would have missed out on it if I stuck to my own rules. It was difficult to get a swatch picture since the Velvet Gloss texture appears so wet on skin, but that translates to plenty of fun for the lips! Mexican Rose was my first Velvet Gloss Lip Pencil so I didn't know what to expect. I thought it was just a gloss in pencil form and would have the wear time of one, but it turned out to be a mighty lip stain instead. I wore it through a bowl of udon and only the innermost portion of my lips experienced minor fading. The rest of the lips lost its shine but the vibrant color remained. Another instance of shocking staying power: after it completely dries (be it from eating or wiping your lips on a napkin), try running your fingers over the color. It wouldn't smear nor leave residue on your fingers. When I was removing my makeup at the end of the day it barely budged with regular makeup remover. Only after a good scrub with oil cleanser did it finally consent to part from my lips. Now, this might sound like too much of a hassle for some but is ideal in my book. If I don't need to reapply throughout the day, I wouldn't need to bring it out! Can you hear the cheerful chorus of my bags rejoicing? Also, for what is ultimately a lip stain, it is not drying at all. While I do like the precision of the pencil (my own mistakes in application notwithstanding), I wonder if that precision persists when the tip becomes dull. It would be an expensive investment indeed if frequent resharpening is needed. 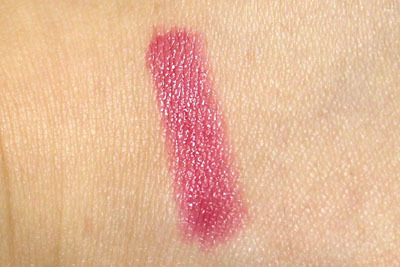 NARS Mexican Rose retails for $24 and is available at narscosmetics.com. PS: Speaking of fabulous lip color, I want to give a shout out to dear Jessica of Getting Cheeky, who is now a fellow Lipstick Bandit. Long overdue, lovely! Beautiful. Can't wait to get this! I've heard amazing things about Mexican Rose's lasting power, so I think it's probably a good investment! I've never owned a lip pencil though, and I wonder how they'll work for me. Gorgeous look! I have the New Lover pencil and it's fabulous! Congrats to Jessica! As an aside, are you wearing Lhasa eyeshadow? Your FOTD is very harmonious in color, and I'd love to know what you used, including cheeks, if you don't mind saying. I've been forcing myself to stay away from this collection, but my resolve is becoming paper thin. Charlie- you're gonna look awesome in it! Sunny- teehee! The only bad thing I've heard about it is the sharpening aspect. Otherwise, it's pure love. Kayla- can't wait to see it on you! Zuzu*s Petals- Thank you! I think it is darker on my lips than some because my lips are naturally very pigmented. And guilty as charged. My entire face is NARS Spring: Lhasa eye shadow and Gaiety Blush. I'll be reviewing these within the next week! So, shall I get this or the Pomegranate one by Bite? ...Both I think! To which my wallet shakes its fist and says, "daaaamn you, woman!" Actually, it's saying that to YOU, coz YOU'RE making me want to go buy Mexican Rose! Apologies for this comment, it's very early for me -_-'. Ooh, I've seen swatches of this, but didn't realize that it was more of a stain and lasted so well! This makes is very appealing . . .
Eeeee. Your lipstick and your eyeshadow are both so stunning in this. YOU look stunning. I got this and Lhasa shadow too and have been wearing it every day! Oh, bloody hell. That is EXTREMELY ATTRACTIVE, XIAO. You're making me use my LOUD VOICE at you; it's that pretty. I got this and Lhasa from the Spring 2012 collection. I must say, the color looks WAY more amazing on you than it does on me. I too wonder what happens when the tip goes dull. We should report back once the pencils are done. absolutely DROOLING at this lip pencil and the model who wore it perfectly! *dramatic intake of breath* I LOVE Mexican Rose on you! It's so vivid and lovely, just in time for spring. Thank you for the shout out, doll! I'm so excited to be apart of the "gang!" STUH-NING! I would love a lip product that I don't have to constantly reapply, even after eating. Will be stalking these for more colors thanks to you! This pencil is awesome I have a couple in my channel bag!